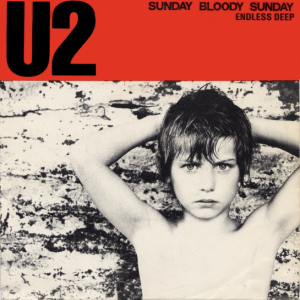 Sunday Bloody Sunday was one of U2's earlier 'big songs' that had some chart success. Instantly recognizable by its drum beat and brilliantly simple intro D/Gm/G chord intro riff, the song's lyrics refer to the infamous 'Bloody Sunday' violence in Derry, Ireland where British troops shot and killed civil rights marchers. The song has become one of U2's classic songs where the lyrics focus on warfare and political matters. Sunday Bloody Sunday Song lyrics from the War album.